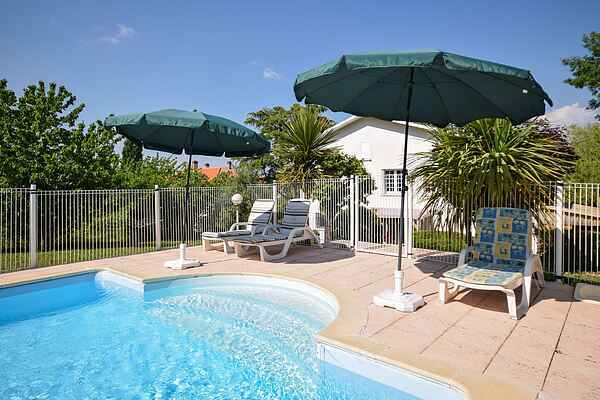 This beautiful white villa is a pearl in the landscape of the attractive Pujols just a kilometer away from the bustling city of Villeneuve-sur-Lot. The villa is tastefully furnished with an eye for comfort: living room with sitting area and French doors to the terrace so you can enjoy the view while having breakfast. There is enough room for a larger group or for example for two families. The villa stands on a vast terrain of approximately 2500 m² with lots of privacy and stunning views of the wooded surroundings. There are several terraces around the house with a green garden on the south. Through the wide, natural staircase you come to the private pool. Tennis court, supermarket and bakery in Villeneuve-sur-Lot (1 km). In the vicinity of the house the fortified Saint-Pastour (15 kms), Monclar (18 km) and Laparade (24 km). Leisure Lakes at Le Temple-sur-Lot (15 km) where you can sail and surf. Along the river Lot is a cycle route to Fumel (27 km). Spend a day at Walibi in the medieval town of Agen (29 km) to spoil the kids. Also a nice place for shopping or discovering culture.